The musings, advice, stories, tips, and much more of a 25+ year veteran of the antiques business. From a picker to a picker/dealer, and back! These days Canadian Pickers is existing only in re-runs. So, the way should be clear for American Pickers to come to Canada, right? Well, it hasn't happened (for reasons unknown), and now is less likely to happen. Yep, a DUI....was intoxicated on booze and Xanax, apparently. The first thing you are probably thinking of by the title of this posting are things like shipwreck artifacts. That is, artifacts salvaged from a what was a tragedy. Frankly, that is an area of collecting expertise well covered by collectors across the world. One associate of mine specializes in items with dark histories; and one of his collections includes artifacts from the Titanic disaster. Someone has to preserve such items, and I have no problem with collections of items from such events, as it is history preservation. The items I have a problem with that have a dark provenance tend to have acquired that darkness of history far more recently. Nautical antiques, from ship lighting, port holes, ship compasses, furniture, bouys, bells, assorted architectural details, and countless other artifacts are sourced from ships that have undergone renovations, or more than likely have literally been broken up and the hulks pillaged and salvaged until there is nothing of value left. Ship breaking is the source of the vast majority of nautical antiques and collectibles out there today, especially when it comes to 1950s and newer items from these vessels. Ship breaking is an industry that is undertaken in several countries, and the business of ship breaking in third world countries is a scary industry; one responsible for horrid working conditions, pollution and environmental damage, horrific deaths of workers...and in some cases slavery-like conditions & use of child labour. And, with such unregulated and unsafe conditions, how do you know that item you are purchasing is not in some way been contaminated with hazardous chemicals/substances, radioactivity, etc? So, you may wish to view these two videos before purchasing that neat light, brass ship gizmo, vintage life preserver, etc, and strive to find out the source of that item first. HEY, TV Production Companies! How about a change? Reality TV has touched on the antiques and collectibles business, but TV production companies are missing a huge market that they should have long since realized exists. There is obviously a large market for vintage themed reality TV shows such as American Pickers, Storage Wars, and a long list of vintage related shows that are running on assorted networks, not to mention another long list of shows which have come and gone (though some have reached temporary immortality by way of re-runs). Now, it has been established that a substantial market for a vintage themed shows exists, that is obvious. But we vintage themed folks also enjoy more than "reality" themed shows. We are part of the general viewing public, after all. How about a FICTIONAL show about the antiques business? Or are we stuck with trying to find and watch reruns of Lovejoy ? It would be good my friends, very good...just like the antiques business itself, it would have unique characters galore, twists, turns, shocks, and surprises, not to mention inside information, jokes, etc geared to those in the world of vintage. It will be one of those shows where there are times you want to turn away, but just can't. So how about it, all you TV execs out there? When do we get our own truly fictional shows? One of the questions on people's minds in the antiques & collectibles biz is what the future holds for the business. It is a business that relies on new blood to come to it, and if the same people are the only market, the market gets thin, values plummet. Well, change is the way of the world, and changing is what you have to do. It is adapt or die, really. One of the areas of collecting that has come in to its own is technology. This Canadian produced show is in the Canadian market (soon to the US market? ), and at the time of this blog has had a half dozen episodes aired already. The show does keep its premise pretty simple, with hosts Shaun Hatton & Bohus Blahut travelling many miles across the US and Canada searching for vintage tech at flea markets, at garage sales, in old warehouses, etc. It is a familiar formula, that seems at first was borrowed from American Pickers. It is far from the first show to utilize a version of the formula, and I doubt is going to be the last, as a successful formula is not something production companies are going to sit and ignore. It is cut back a little in comparison to American Pickers, resulting in a more streamlined show, which is "lighter" and as a result actually does seem more palatable & appealing in its content to those who are not necessarily into vintage tech. So, the next time you walk by a vintage video game system, some ancient electric gadget, or that video disc player, think about the money you could well be leaving on the table. Too Little Too Late - Treasure Found!! One of the treasures I mentioned in previous blogs has been essentially located...or, rather, there are some researchers/treasure hunters already ahead of me, hot on the trail of the cache. I mentioned this lead in my posting here. I can give more details now that there is someone else on the case, and are advanced in their seeking what is literally a mass of over 200 antique weapons, including antique guns, knives, trade axes, etc.!!! This is a historic find, and literally is a part of Western Canadian History. Now, due to the location of this find, should I have gone after it and gotten there before the current researchers, I would have been only the finder, not the keeper of this historic weapons find. Instead of me simply regurgitating information, I suggest you read the article here. And that is what can happen when you do not follow up your leads in a timely fashion! As they say, treasure is in the eye of the beholder. If you don't see an item as treasure, it is not treasure....at least to you. So, what do you view as treasure? Which would you recognize as treasure? Would you know the Grail if you did see it in a pile of junk? Considering no one really knows what the Grail looks like, probably not. But that toy, laying amongst trash, you would spot it right away. Maybe lying next to the Grail itself! The point I am making, if you haven't already figured it out, is that knowledge; the ability to recognize what is "treasure" makes all the difference in succeeding in finding treasure. Did you know that gold smugglers would melt gold and cast it into day to day utilitarian items? Horse bits were one of the choices smugglers supposedly used, for example. In one old treasure magazine I remember reading that a treasure hunter had found what he thought was a gray, painted, cast iron spittoon in an old gold rush town bar...a scratch revealed it was actually solid gold! A fortune in gold, sitting in plain sight for years! Anyway, knowing these bits of information and many more tid bits of information you will learn over the years could be your key to finding true treasure. If a Picker Quit Pickin', What Would a Picker Do? That is a question that has been on my mind lately. Well, if I couldn't be in this business for some reason or other, what would I do? How would I make a living? I would definitely scale down my expenses, which I strive to do as it is. I have higher expenses simply because I am limited as to my selection on places to live, because I need to set up my business somewhere appropriate, somewhere with lots of traffic. Setting up in some little town in the middle of no-where is not really conducive to long term success, in general. After the property I am on now is sold, my next location will be visible from #1 highway, pure and simple. The Trans Canada is "the" highway, especially when it comes to the prairie provinces. Traffic going anywhere is likely going to be travelling down the #1. Thousands of vehicles travel that route daily. It is the busiest thoroughfare in the prairie provinces. So, establishing a store on #1 is the goal. But, back to the question, if I couldn't be in this business, what would I do? I have things I'd like to do.....but what would I do, in the way of making a living? The scary thing is, I really don't know. Could I make a living doing the other things I'd like to do? I am a writer, so if I had a writing gig of some sort that would actually pay real money, then that is a possibility. I do have some ideas for screenplays, IE: cable-type shows. Anyone know of a producer looking for some truly fresh ideas? What is a picker to do? 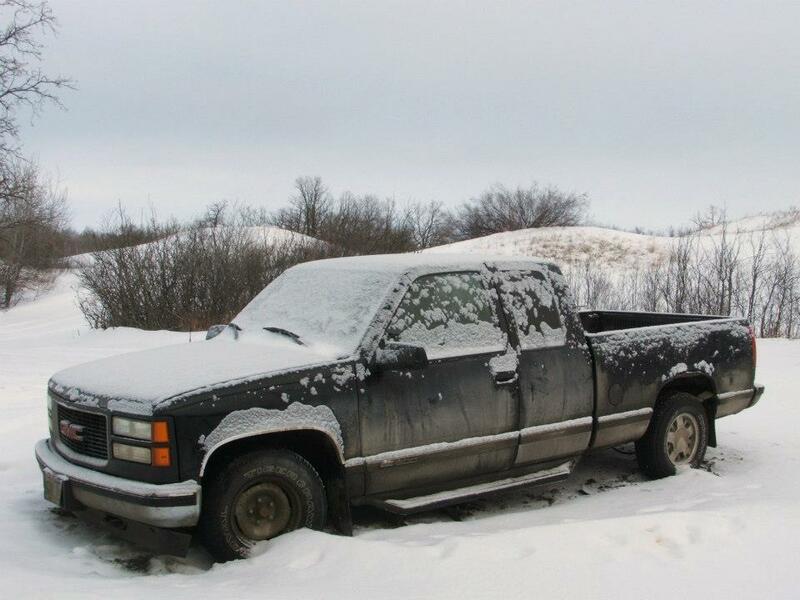 A picker's vehicle is one of the most important tools he/she has. These have been my "pickermobiles" over the years. I fit 5 to 6 eight foot banquet tables worth of inventory into this car, and even then the inventory was crammed on my show tables. Even managed to haul a 12' long Texaco sign and a gas pump in these cars! Acadian is shown wrecked after an accident. Walked away from it, luckily, with just bruises...some big bruises, but just bruises. With a cap on the back, this vehicle served me very well. Did lots of picking in this truck. 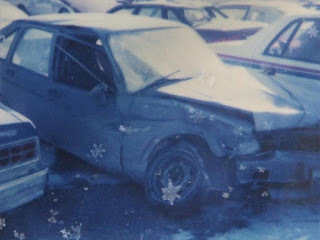 Again, shown as it was, written off by MPIC, after a kid, driving his father's brand new truck, hit it on glare ice....marooning me & my girlfriend at the time in Shoal Lake for the better part of a week! The first van I bought, and which hooked me on Ford full size vans. Reliable, durable, but rust prone as they age..... But, "pretty" is not what a picker should be after when it comes to a vehicle! Had another full size passenger van that I used temporarily inbetween these two. Put the back mounts of the leaf springs through the rusted out floor by hauling too heavy of scrap metal loads...couldn't close the back doors by the time I took it off the road. A 3/4 ton van, this one cost me a fair bit in repairs, etc, but overall served me well. Used this as a temporary measure, but the 3/4 size box wasn't very utilitarian. The crew cab was ok for hauling stuff you didn't want to get dusty, but overall the truck was limited as far as using it for serious picking went. 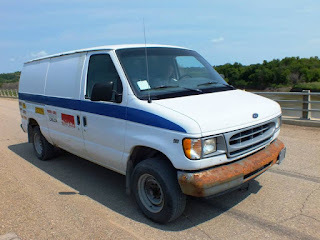 As of this posting, I am using a 1 ton Ford passenger van with the rear passenger seats, carpeted flooring, and assorted plastic interior trim removed. It was what I was able to find when I needed a van. The gutting took a bit of time, but it now serves its purpose. This one is a little more expensive when it comes to repairs, but it handles weight just fine. 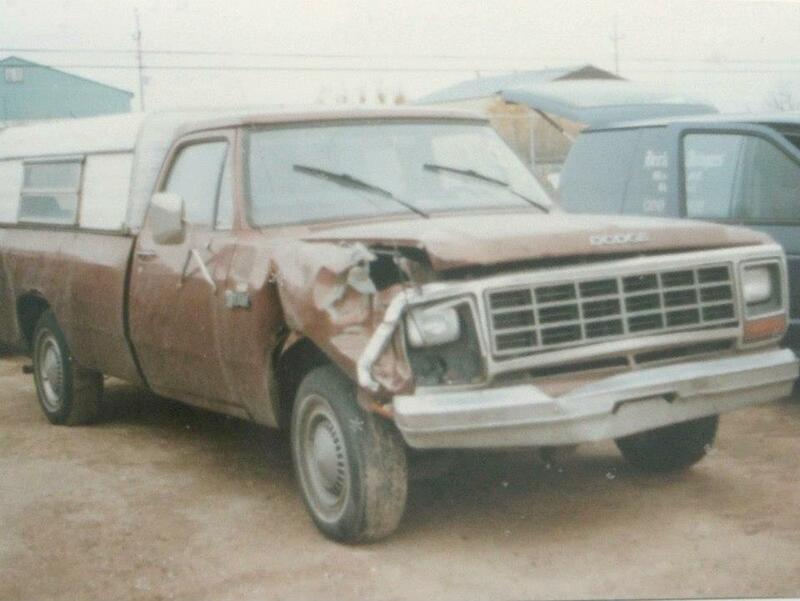 Has the usual Ford body rust issues, but it will have to do for awhile. It isn't pretty, but it does the job. I should note, I owned all these vehicles outright. No leases, bank loans, etc. They also were my "daily drivers", not just my picking vehicles. 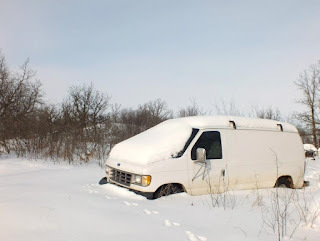 So, what is/was/were your pickermobile(s)? Once and awhile you pick an item that makes your heart skip a beat, a real treasure. This garage sale find was one of those. What was the item? Only a Currier & Ives hand tinted print, titled AMERICAN EXPRESS TRAIN. I've since sold the print, so I can only offer you a photo of a photograph I have, as seen below. It was impressive, being quite large, roughly 3' wide, and it had been matted and framed. The frame was a modern one, with holes drilled in the edges. That does raise a red flag, as it usually indicates it was screwed to the wall of a restaurant or hotel room, and that would scream that it was likely a reproduction. Anyways, the print in question was well done, and as far as any of the knowledgeable local dealers could tell, it was the "real deal." Now I was getting enthused! Why? Well, I had been looking through a magazine, and there was an article on that very print....the last one of these that sold at auction not a year before I found mine, had sold in range of $50,000! So, the next thing I had to do was send it to an auction house, which I did. I seem to recall it was Sotheby's in New York, I believe. So, I sent it on its way, rolled in a tube, and awaited their assessment. I was told it was a very high quality piece.....but they would not be interested in consigning it in their auction, as it was also a reproduction. They sent it back to me....with a bill for professional art packing, amounting to $250 US or so! So, my initial $15 purchase now totalled a cost of nearly $200. It was most certain professionally packed, flat, and well protected....but I would have been happier had they sent it back to me in a tube as I had sent it to them. On the plus side, they appraised it at $500. In the end, I did sell it on eBay, for $350, as a high quality reproduction. It was a learning experience, which luckily I basically broke even, between postage, eBay fees, time, etc. Oh well, can't win them all....but winning one once and awhile would be nice, wouldn't it? We covered Arsenic and wallpaper already, but another source of Arsenic you may come across is in old books. Potentially, the green colouration of some of those early books could well be Arsenic based. Though, more than likely, it is present as "Paris Green", have being applied to prevent insect damage to said books. The article here will give you some more details. Containers of Paris Green itself tend to pop up in many places. I have seen more containers of it than I can count, from little tins to gallon pails of the stuff. Many people whose sheds, basements, barns, etc I have gone through realized this poison was present at all. "Paris Green" does sound innocuous enough....but the skull and crossbones printed on some of the cans should be warning enough, you'd think. Anyway, just another little tip to help you stay safe while picking! In the early 1990s, I was picking one summer afternoon, driving east of Winnipeg, and ended up in the northern Ontario town of Kenora. But, as it turned out, after a good hour of scoping things out, this was not going to be the superb pick I had in my mind when I first walked in. The aged owners, despite keeping the interior all original, had a prosperous & modern business where they kept a very up to date inventory. All new, fresh shiny inventory graved every inch and area of the place. Nothing of any real age was displayed, aside from a few store fixtures & store displays that were in use, and not a single one would they entertain selling. It was quite a contrast, the oak cabinetry that lined the walls, and the modern inventory that it showcased. But, it was an old school, working hardware store, and it still held that magic feeling of a place time forgot. They had made good use of the 3 story building. Even the full basement they turned into retail space for their wares. However, despite their efforts, it turned out the place still held a few vintage trinkets.....but only on the third floor, in a tiny former storage room, frequented by only by the most curious of customers who bothered to venture up the steep worn staircase. It wasn't be retained as storage.... no, the merchandise in there was on display for sale, also! They were certainly utilizing every inch of space in that store for inventory display! I did spot an attic door which I never did get to venture through, so who knows what it held...though, it may have been as empty and sparse as the little storage room I was in. From the little former storage room I purchased some odd items....some NOS jockstraps from the 1970s, a bit of common depression glass, and I even pulled a couple old light bulbs from a crate on the bottom shelf. The crate was chock full of the thick-with-dust, obsolete, delicate glass & brass pieces, each carefully fitted in its own cardboard sleeve. To my surprise, each one I pulled out had a little slip of paper glued to it, with the name of the very hardware store I was standing in. Looking at the darkened brass end, it was apparent there was no way they could be used in today's Edison style sockets. The had a hole in the center, and it was apparent that they screwed onto a rod, and down into a smooth sided socket. They would make a neat souvenir of that pick, I thought. A quaint souvenir only, because who in the their right mind would want old light bulbs? So, then time passed....a few years of time. eBay came into my life in the following years, and out of novelty, I decided to put one of my Victorian light bulb souvenirs up for auction. When it hit over $140, I realized I needed to make a trip back to that hardware store! So, I went back, and it turned out the owners had been selling the bulbs as souvenirs of the store at their front counter! The price was $2 each! Keeping a stone face, but jumping inside, I went upstairs and went into the little room. I spotted the crate......Luckily for me, they obviously had been slow sellers, as there looked like there was nary a half dozen more missing from the crate since I had last seen it! I brought the entire crate down..and when they counted them up, they ended up giving me a bulk purchase discount! I sold a few more on eBay, with the price dropping a little each time... as the niche market for this particular light bulb was slowly being saturated by my warehouse find. Despite being still significant in number, I ended up getting about $65 a bulb from one buyer for the last of them. You see, it turned out his immaculately restored Victorian home used the very sockets these bulbs fit into! So, in the end, my $2-a-bulb purchase made me literally "thousands" of dollars! So, the next time you see some item that you think it neat, but worth little, think again....educate yourself, do some research! Really, on the long list of things you would assume to be treasure, the lowly light bulb is certainly something you would have envisioned to be on that list! Been awhile since the last post, and being that I am in Facebook Jail (suspended until 5PM today from posting in any groups) for some unknown reason, I thought it would be a good time to blog. Anyways, treasure leads are easy enough to find, if you know were to look, and how to go about finding them. For example, during the fur trade era, to my understanding, every capsized canoe belonging to the HBC of bales of furs and goods was recorded. (I am not sure about the canoes of other companies, nor independent traders.) Those bales of goods and furs are now sitting in the middle of various rivers. Due to the fast moving water in some of these rivers, the bales are sitting on rocks, as the rushing water tends to clear silt away, and the fur bales are packed thus that they remain intact. So, theoretically, if you were to search the HBC archives, as well as archives for the North-West company, as well as do a ton of reading of various true fur trade tales, you may well be able to find the location of those lost bales. Some time ago there was a Manitoba University prof who that did just that. He ended up diving for one or some of these bales, and recovered at least one, if I am recalling correctly. Imagine finding a bale of trade goods, all of which are highly collectible and worth some good money! Even a bale of furs would be a real find, a solid piece of history you can touch. A Canadian Prairie Treasure Lead You Can Pursue! Was doing some digging online and tripped across this interesting bit of information. If you find the treasure you owe me a case of good beer! marked the boulder with charcoal and by the time he got out of jail it had allwashed off in the rain." He marked the boulder with charcoal? Now that was not a very smart thief....! Note that the stolen loot was supposedly never recovered. 'The forks' it refers to is where the north and south Saskatchewan meet. Got a little ahead of myself, with 13 coming before 12....but, here is treasure lead #12! Imagine a little town, situated along a river. A torrential flooding like no other in recent history wipes through the town sweeping buildings and contents in its wake, including the bank. 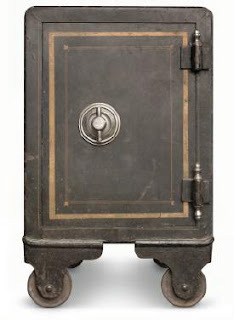 Yes, the bank....and its contents, including two full safes. Still lost to this day, likely on the bottom of the river, possibly buried in the banks, or possibly the surrounding field, if the river has moved position due to erosion. Time to get out the backhoe! One side wins this particular battle, and seizes all the weapons of the other side. What to do with these excess weapons? Dump them in a river. So, #13 might be lucky for me, we shall see. DONATE TO THE PICKING FUND!